The political process necessary for planning and implementing a new degree program at Northern Arizona University (NAU), The Educational Technology Master of Education (M. Ed. ), began in the spring of 1997. The program was finally discussed and approved by the Arizona Board of Regents at their February, 2000 meeting. However, over the three years of establishing the program, it became much more than just a political or academic task. As the process of research, discussion, and reflection was experienced while searching for an ideal M. Ed. in Educational Technology program, current struggles with new pedagogies and new approaches were exemplified. The program development became living proof that changes in thinking and doing come over time, not in a day, or a week, or even a year. As the developers struggled to articulate to each other what they believed to be important, they became what can only be hoped for students in this new program: uncomfortable learners who stretched their minds and pushed the envelopes of their comfort zones to complete an engaging and meaningful task. Willis, E., Tucker, G. & Gunn, C. (2003). Developing an Online Master of Education in Educational Technology in a Learning Paradigm: The Process and The Product. Journal of Technology and Teacher Education, 11 (1), 5-21. Norfolk, VA: Society for Information Technology & Teacher Education. Retrieved April 23, 2019 from https://www.learntechlib.org/primary/p/17792/. Fulton, K. (1996). Moving from boxes and wires to 21st century teaching. T.H.E. Journal, 24(4), 76-82. Moore, J. (1991). Crossing the chasm. New York: HarperBusiness. Moore, J. (1995). Inside the tornado. New York: HarperBusiness. Mumford, L. (1939). Technics and civilization. New York: Harcourt, Brace. Norton, P., Sprague, D. (1995). Changing teachers—teachers changing schools: Assessing a graduate program in technology education. 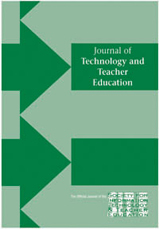 Journal of Information Technology for Teacher Education, 5(1/2), 93-105. Norton, P., & Sprague, D. (1997). A proposal for revision of track two— in-s truc t iona l technology program: Integration of technology in schools. Fairfax, VA: Graduate School of Education, George Mason University. Office of Technology Assessment (1995). Teachers and technology: Making the connection (No. OTA-HER-616). Washington, DC: U.S. Government Printing Office. Turkle, A. (1995). Life on the screen: Identity in the age of the internet. New York: Simon& Schuster.